Online romance and intrigue, Victorian style! Channel 4 has just launched what it calls an “enhanced comic”, “The Thrill Electric”, which was inspired in part by my book “The Victorian Internet”. I’m not sure about some of the language anachronisms (people only started having “issues” rather than “problems” relatively recently) but I love the way it spins a story around the life of a female telegraph operator. You need to download a plug-in to view it, but give it a try — the result is indeed an enhanced comic-strip, with the elements in each panel moving in that pseudo-3D effect which is also used to liven up old photos in documentaries. Argh! New technology is going to kill newspapers! In this week’s Christmas issue of The Economist I explain why people were worried about this — in 1845 — and what actually happened. The new technology in question was the telegraph, and newspapers co-opted it, rather than being destroyed by it. Will that also happen with the internet? As I have argued here previously, the internet is different because it does challenge the last-mile delivery of newspapers. (The telegraph was not a threat to papers in the end because although it delivered news faster, it could not distribute it to subscribers. The internet can do both.) So the internet may well kill newspapers; but newspapers are merely one business model for the delivery of news, and there is no reason why they should survive. The death of newspapers is not the same as the death of news. Already we are seeing new models emerge that do not depend on paper. Some publications will make the leap; many will not. If I was setting up a newspaper today I’d want it to look a lot like Bloomberg: global network of reporters, cash-cow terminals/financial information business to pay the bills, and (now) a consumer brand in the form of BusinessWeek. As this article argues, Bloomberg has a lot going for it, and it may prove to be the greatest competitor to The Economist in the medium term. Something for the next editor-in-chief to worry about, perhaps. My book was used to set three questions about “old social media” (ie, the telegraph) for Rick Sanchez of CNN on the “Not My Job” slot on “Wait Wait… Don’t Tell Me”. What was the single non-military application that Napoleon allowed the French telegraph network to be used for? Which object did a woman try to send by telegraph in the 1870s? And what kind of messages did the Atlantic cable of 1858 carry for the first few weeks after being connected? You can find out here. I was actually asked to suggest some questions myself by Peter Sagal, the host, but my suggestions weren’t funny enough (except for the sauerkraut). Oops — that’s one of the answers. Aside from my food book, the project that has consumed most of my mental bandwidth this year has been my special report on telecoms in emerging markets, which is published in The Economist today, and is on the cover everywhere except Britain. 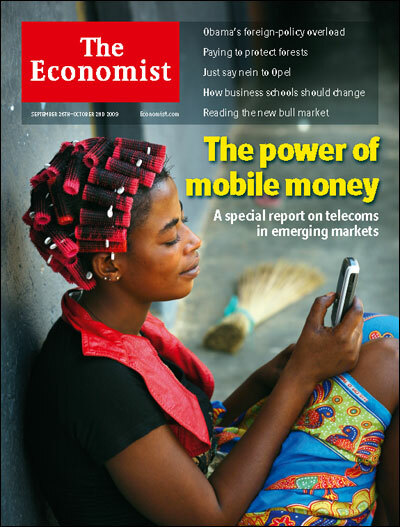 The accompanying cover article highlights what I think is the most exciting aspect of the report: the potential for mobile money to trigger a second wave of economic development in poor countries, as big as the one caused by the initial introduction of mobile phones. In addition to the cover leader and the 14-page report, there’s also an audio interview in which I summarise the main themes, and a videographic that picks out some of the figures about telecommunications technologies and their impact on development. Yup, it’s a multimedia extravaganza. You have to fight your way through to the end of the report before you get to the inevitable telegraph reference; it’s actually in the last paragraph. My point: that the project to connect everyone on earth to a single communications network, which began with the invention of the telegraph in 1791, is on the verge of completion. Within a decade, it’s likely that everyone who wants a mobile phone will have one. The next step will be to make access to the internet just as universal. Being able to write a special report like this is one of the best things about working at The Economist. We usually get five weeks off to do it, a generous travel budget, and 14 pages in which to lay out our arguments. (It’s also the only time we get a byline.) I took three weeks off to do this report — one was spent doing reporting in Uganda, and the other two were spent writing at home — but I’ve actually been researching it pretty intensively since the start of the year. It’s like doing a small book. And as with a book, it’s great to see it finally emerge into the world. If this mode of transmitting intelligence fully succeeds and comes into universal operation — as no doubt it will — an entire revolution in many of the present institutions and elements of society will be effected. In regard to the newspaper press, it will experience to a degree, that must in a vast number of cases be fatal, the effects of the new mode of circulating intelligence. The telegraph may not affect magazine literature, nor those newspapers that have some peculiar characteristic. But the mere newspapers — the circulators of intelligence merely — must submit to destiny, and go out of existence. That journalism, however, which possesses intellect, mind and originality, will not suffer. Its sphere of action will be widened. It will, in fact, be more influential than ever. The public mind will be stimulated to greater activity by the rapid circulation of news. The swift communication of tidings of great events will awake in the masses of the community still keener interest in public affairs. Thus the intellectual, philosophic and original journalist, will have a greater, a more excited, and more thoughtful audience than ever. This prediction was wrong, of course. The telegraph did not destroy newspapers — it provided them instead with a vast new supply of information. It became worthwhile to produce several editions of a newspaper a day. If there was a fast-moving story, people might buy more than one paper a day. The telegraph was great at delivering news, but it could not deliver it directly to subscribers, since it was an expensive, hard-to-use point-to-point medium. So the telegraph actually strengthened the newspapers’ existing business model, which was to aggregate news for readers, and readers for advertisers. Today the problem for the newspapers is that the modern-day telegraph, the internet, does undermine their model, because it’s easy to use and ubiquitous. Indeed, the newspapers have been undermining it themselves by making their content available free online, where there are fewer advertising dollars available. In recent days there has been a lot of fuss about whether newspapers should deny news aggregator sites, such as Google News and Digg, the right to link to their stories. As many observers have pointed out, but very few newspaper bosses seem to have realised, this would be idiotic, because aggregators drive a lot of traffic to news sites. Having fewer readers would hardly improve matters; what is needed is a new business model. I think newspapers will have to start charging for their content in some form, and that will be easier to do if they have something distinctive to offer. But many newspapers have been going the other way, following the herd and rewriting wire copy in response to what seems to be popular on Digg or the Drudge Report. The article from 1845 had it right. Newspapers “that have some peculiar characteristic” (such as the Wall Street Journal, which does charge readers) will be better positioned. And journalism “which possesses intellect, mind and originality, will not suffer.” Of course, I’d like to think that applies to The Economist, which has just had a bumper year, and is generally doing well. The gloomy prediction of the death of “mere newspapers” at the hands of new technology turned out to be wrong in 1845, but seems to be coming true 164 years later. 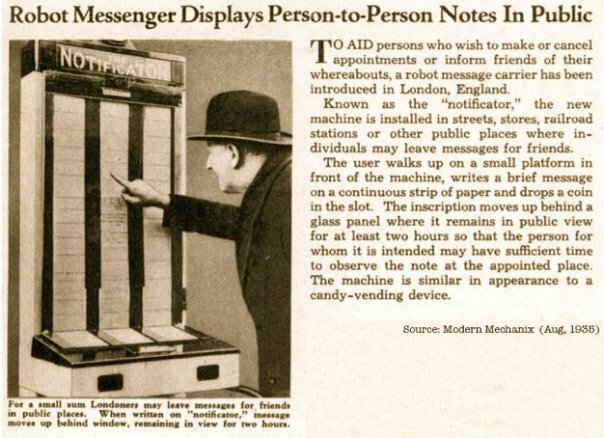 And while we’re on the subject, here’s a machine that essentially did what Twitter does, but did it in 1935. (Hat tip to Dan Hollings, via Michele.) Have I mentioned that I love this stuff? 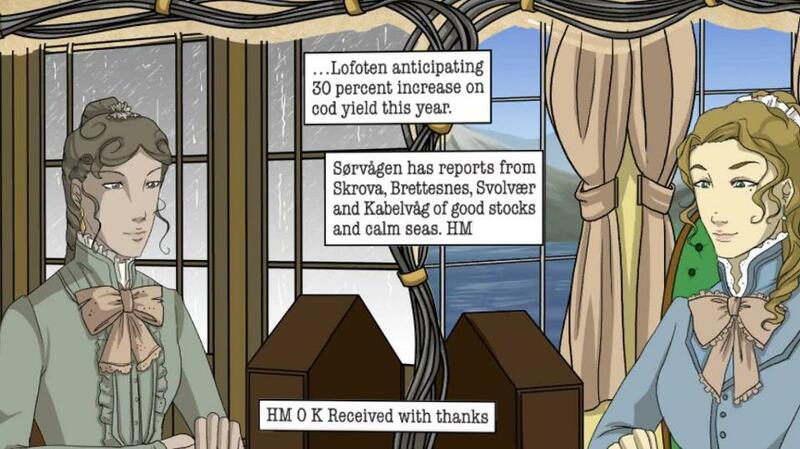 Mobile-phone text messages (SMS) have a lot in common with telegrams, as I have pointed out on several occasions. The need for brevity forces you to be concise and encourages the use of abbreviations to save space. And of course I love the fact that Nokia handsets can announce incoming texts with three short beeps, two long ones and three short ones — Morse code for “SMS”. If text messages are Telegram 2.0, however, then might Twitter be Telegram 3.0? Once again the constraint of brevity applies, at any rate. The similarity between telegrams and Twitter messages (tweets) is explored by An Xiao, an artist based in New York, in a new piece that has just gone on show at the Brooklyn Museum (her video explanation). She’s taking a Twitter feed and turning it into audible Morse code. I think this is pretty cool, not least because there are also some portraits by Samuel Morse (himself pictured left) in the museum. An Xiao notes that Twitter got going just after the demise of the telegram in America in early 2006. She also points out that there are some significant differences between Twitter and telegrams. Twitter messages are broadcast (one-to-many); telegrams were generally one-to-one messages. The other big difference is that the cost per bit has fallen to zero since the days of the telegraph. So instead of being used to send urgent messages, as telegrams were, tweets tend to be used to send trivia. Once you have near-instant point-to-point messaging, you can’t get any faster — just more verbose and trivial.